Family Group: Left to right back row - Martin, Cheryl, Lynne. Front row - Harvey, Ivan, Arwen and Oscar. 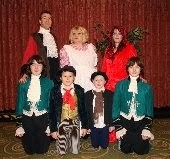 Meet The Collis Family who will be giving our very own Tonbridge Panto a truly local feel. There's mum Lynne ... dad Martin ... sons Oscar, Harvey, Ivan and daughter Arwen who all have roles in this colourful production, presented as always by Tonbridge Lions Club. Lynne, who was last seen (or more precisely not seen) as the 'back end of the cow', in Jack and the Beanstalk, plays the part of Carabosse, the evil Godmother. And ... this year Martin plays The Lord Chancellor. The family connection doesn't stop there as Lynne’s sister, Cheryl Crouch, who was last year's wonderful 'front end of the cow', will definitely be seen a little more this time round as she plays the part of the Nanny. The CLIPS Theatre Company who have been part of the Tonbridge scene now for 20 years prides itself on utilising local talent in its community pantomime productions every year. And, just as important you can be sure that by supporting your own Tonbridge pantomime all proceeds go to help local charities. A perfect combination and all you need to do is enjoy the fun, join in with the hilarity, songs and boos and hisses that a traditional panto has to offer, and the kids and grown-ups alike will love it. This really is a local pantomine, with a local cast and for the local people (those from further afield are of course most welcome as this is probably the best panto in the area). Don't miss out and BOOK NOW to avoid disappointment. You all want to go don't you? Yes... of course you do. Saturday December 21st (10.30am, 2.30pm and 6.30pm). All available from the Angel Centre Box Office 01732 359966.